The gloom and glow of Winter is officially here and I for one am relishing it. I love eating with the seasons. At this time of year the farmer’s markets are gifted with squeaky leeks, onions of all kinds, crisp carrots and dark bitter greens. There’s something deeply comforting about the rich stews and soups we make at this time of year, both nourishing to the soul and body. That said, sometimes I get a little tired of stews. Warming as they are, my tongue craves something more at this time of year. Something that combines nourishment with satisfaction – hearty comfort food that appeals to both my body and my tastebuds. I want something that nurtures but also tastes delicious. 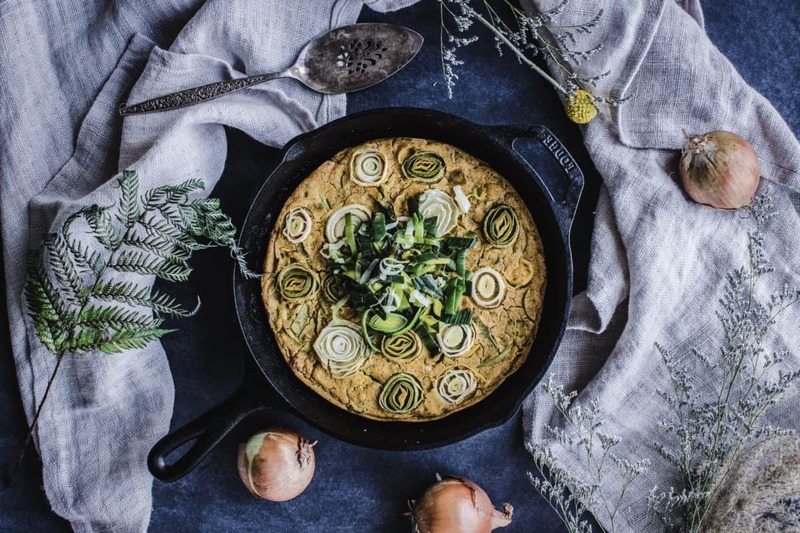 This Vegan Leek & Onion Frittata was created in answer to an Instagram photography challenge. I was so happy with the results that I decided it was worth creating a full recipe for! The frittata is delicious – very filling (due to the chickpea flour), warming and hearty. It’s virtually a meal on its own, although you could easily serve it with a side of steamed black kale or broccoli. It’s high in protein and will leave you feeling comforted and satisfied on a winter’s night. If you like a naturally whole food meal, then follow the recipe just as it is. 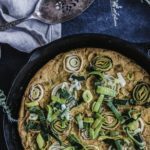 If however you want to take this Vegan Leek & Onion Frittata to the next level, add a cup of your favourite vegan cheese. There’s something about adding cheese to a dish that makes it taste moreish, and this one is no exception! Sprinkling the cheese over the frittata before you bake it means that it will come out of the oven with a salty, crispy, creamy topping that is incredibly satisfying. I defy you to say otherwise! 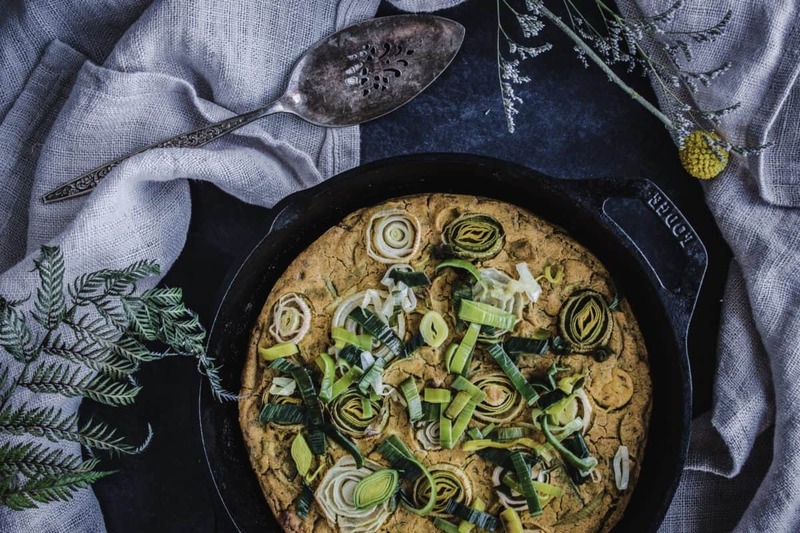 For a plant-based twist on the classic dish, try this delicious Vegan Leek & Onion Frittata. It's healthy, naturally gluten-free and oh-so-simple to make. Cut the onion into ½cm discs crossways, setting aside 4-5 of the smallest discs (these will be used for decoration later). Slice the leek the same way, again reserving 4-5 sliced discs for decoration later. Then set the leek aside. 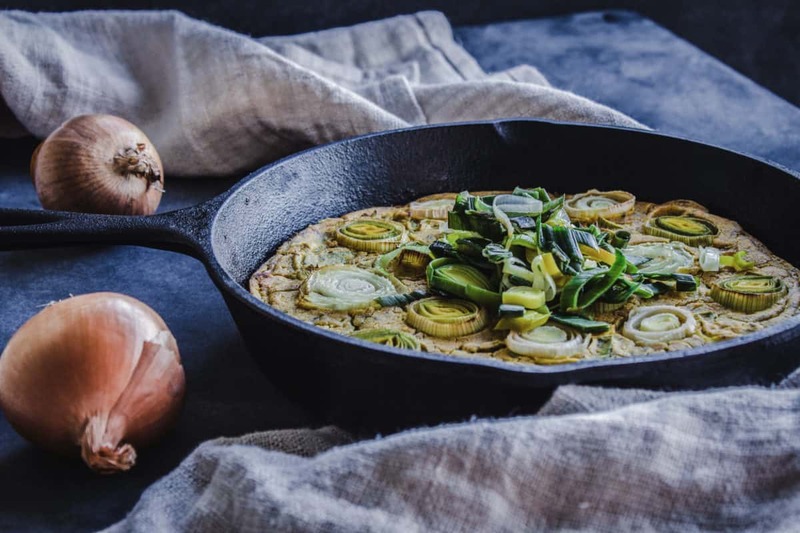 Using 1 tbsp of the oil, gently fry the onion slices (except the decorative ones) in a pan on the stovetop for about 10-15 minutes stirring frequently, until they are lightly golden and soft. Remove from the heat and set aside. In a large mixing bowl, add the crushed garlic, chickpea flour, thyme, paprika, turmeric, onion powder, garlic powder, pepper and salt. Stir to combine all ingredients and add the water. Using a hand or manual whisk, whisk the mixture until there are no lumps of flour and it has a smooth consistency (about a minute). Add the raw leek (except for the decorative slices) and whisk again to mix. Pour the frittata mixture into the pan, ensuring that it evenly coats the surface. Arrange your reserved onion and leek discs in a decorative pattern on the surface (see photos for example), and if you wish, add shreds of your favourite grated vegan cheese to the surface as well. Bake in the oven for 25-30 minutes, until the frittata surface is firm and golden, the cheese is melted (if using) and the decorative leeks/onions are starting to brown. Remove from the oven, cut into slices and serve immediately straight from the pan. This dish is best served straight from the oven. As it cools it will harden - it's still completely edible, but it is better fresh.